Development and characterization of adenoviral vectors for use in gene therapy. Exploring exosomes as biomarkers and therapeutic delivery vehicles for motor neuron disease, including spinal muscular atrophy (SMA) and amyotrophic lateral sclerosis (ALS). Improving the efficacy of adenovirus-based oncolytic viruses for treatment of cancer. Expanding our knowledge of basic adenovirus biology, and identifying novel drugs to combat adenovirus-induced disease. Our research interests range from characterizing various aspects of basic adenovirus (Ad) biology to exploring the efficacy of Ad-based vectors for the delivery of therapeutic genes in animal models of genetic or acquired disease. Ad is the most commonly used gene delivery platform for gene therapy applications, and our goal is to improve our understanding of Ad biology to enhance its safety and efficacy as a gene delivery vehicle. More recently, we explored the use of exosomes, small nano-sized particles released from all cells in the body, as potential biomarkers for motor neuron disease – to aid in disease diagnosis and monitoring response to therapy. Given that exosomes are naturally involved in cell-to-cell communication, we are also exploring exosomes as a means to deliver therapeutic proteins to diseased cells in cell culture and animal models of human disease. We are always looking for talented and motivated graduate students and postdoctoral fellows to join our research team. Please send your curriculum vitae and brief statement of research interest to rparks@ohri.ca. Dr. Parks completed a M.Sc. and Ph.D. in the Department of Molecular Biology and Genetics, University of Guelph (Guelph, Ontario), working on biochemical and genetic characterization of poxvirus replication and recombination. In 1996, Dr. 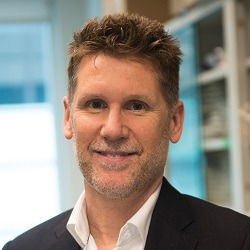 Parks began a Postdoctoral Fellowship with Dr. Frank L. Graham, in the Departments of Biology and Pathology, McMaster University (Hamilton, Ontario), working on the development of novel adenoviral vectors for use as gene delivery vehicles for gene therapy applications. Dr. Parks joined the Ottawa Hospital Research Institute in January 1999. 87. Wong, C.M., K.L. Poulin, G. Tong, C. Christou, M.A. Kennedy, T. Falls, J.C. Bell and R.J. Parks (2016) Adenovirus-mediated expression of the p14 fusion-associated small transmembrane protein promotes cancer cell fusion and apoptosis in vitro but does not provide therapeutic efficacy in a xenograft mouse model of cancer PLoS ONE 11(3):e0151516. doi: 10.1371/journal.pone.0151516. 88. Al-Khalaf, M., L. Blake, B. Larsen, S. Brunette, R. Parks, M. Rudnicki, P. McKinnon, F. Dilworth, R. Bell and L. Megeney (2016) Temporal activation of XRCC1 mediated DNA repair is essential for muscle differentiation. Cell Discovery 2:15041 doi:10.1038/celldisc.2015.41. 89. Smethells, J.R., N. Swalve, S. Brimijoin, Y. Gao, R.J. Parks, A. Greer, and M.E. Carroll (2016) Long-term blockade of cocaine self-administration and locomotor activation in rats by an adenoviral vector-delivered cocaine hydrolase. J Pharmacol Exp Ther. 2016 Mar 11. pii: jpet.116.232504. 90. Burns, J.K., R. Kothary and R.J. Parks (2016) Opening the window: The case for carrier and perinatal screening for spinal muscular atrophy. Neuromuscular Disorders 26:551-9. 91. Warman Chardon, J., B.J. Jasmin, R. Kothary and Parks, R.J., (2016) Report on the 3rd Ottawa International Conference on Neuromuscular Biology, Disease and Therapy – September 24-26, 2015, Ottawa, Canada. Journal of Neuromuscular Diseases. 3:431–442. 92. Wong, C.M., L.A. Nash, J. Del Papa, K.L. Poulin, T. Falls, J.C. Bell, and R.J. Parks (2016) Expression of the fusogenic p14 FAST protein from a replication-defective adenovirus vector does not provide a therapeutic benefit in an immunocompetent mouse model of cancer. Cancer Gene Therapy 23(10):355-364. 93. Alvarez-Saavedra M., Y. De Repentigny, D. Yang, R.W. O'Meara, K. Yan, L.E. Hashem, L. Racacho, I. Ioshikhes, D.E. Bulman, R.J. Parks, R. Kothary, and D.J. Picketts, (2016) Voluntary Running Triggers VGF-Mediated Oligodendrogenesis to Prolong the Lifespan of Snf2h-Null Ataxic Mice. Cell Rep.11:17(3):862-875. 94. Nash, L.A., J.K. Burns, J. Warman Chardon, R. Kothary and R.J. Parks (2016) Spinal Muscular Atrophy: More than a disease of motor neurons? Current Molecular Medicine 16(9):779-792. 95. Del Papa, J. and R.J. Parks (2017) Adenoviral Vectors Armed with Cell Fusion-Inducing Proteins as Anti-Cancer Agents. Viruses 19;9(1). pii: E13. doi: 10.3390/v9010013. 96. Saha, B. and R.J. Parks (2017) Human adenovirus type 5 vectors deleted of early region 1 (E1) undergo limited expression of early replicative E2 proteins and DNA replication in non-permissive cells. PLoS One. 2017 Jul 10;12(7):e0181012. 97. Eid, W., K. Dauner, K.C. Courtney, A. Gagnon, R.J. Parks, A. Sorisky, and X. Zha. (2017) mTORC1 activates SREBP-2 by suppressing cholesterol trafficking to lysosomes in mammalian cells. Proc Natl Acad Sci U S A. 2017 Jul 10. pii: 201705304. doi: 10.1073/pnas.1705304114. 98. Sundaram, M., K.R. Curtis, M.A. Alipour, N.D. LeBlond, K.D. Margison, R.A. Yaworski, R.J. Parks, A.D. McIntyre, R.A. Hegele, M.D. Fullerton, and Z. Yao (2017) The apolipoprotein C-III (Gln38Lys) variant associated with human hypertriglyceridemia is a gain-of-function mutation. J Lipid Res. 58(11):2188-2196..
99. Nash, L.A, E.R. McFall, A.M. Perozzo, M. Turner, K.L. Poulin, Y. De Repentigny, J.K. Burns, H.J. McMillan, J. Warman Chardon, D. Burger, R. Kothary, and R.J. Parks (2017) Survival Motor Neuron Protein is Released from Cells in Exosomes: A Potential Biomarker for Spinal Muscular Atrophy. Scientific Reports 7(1):13859. 100. Parks, R.J. and E. Gussoni (2018) Building immune tolerance through DNA vaccination. Proc Natl Acad Sci U S A. 2018 Sep 25;115(39):9652-9654. doi: 10.1073/pnas.1813461115. 101. Giberson, A.N., B. Saha, K. Campbell, C. Christou, K.L. Poulin, and R.J. Parks. (2018) Human adenoviral DNA association with nucleosomes containing histone variant H3.3 during the early phase of infection is not dependent on viral transcription or replication. Biochem. and Cell. Biol. (in press - available online). 102. Warman Chardon, J., B.J. Jasmin, R. Kothary and Parks, R.J., (2018) Report on the 4th Ottawa International Conference on Neuromuscular Disease and Biology - September 5-7, 2017, Ottawa, Canada. Journal of Neuromuscular Diseases. (in press – available online).